The Faroe Islands want to promote oil and gas exploration close to the UK maritime border by coordinating a license round together with the 32nd Licensing Round in the UK. According to FOIB, the Faroe Oil Industry Group, a proposal for a new round has now been laid before the Faroese parliament whereby the plan is to launch the Faroese 5th Round together with the 32nd Round in the UK in summer. The Faroe Islands have been promoting oil and gas exploration offshore the Faroe Islands with limited success. In the 4th licensing round (2017-18) only 1 application was received and after discussions with the Faroese Geological Survey, the applicant withdrew, and no licenses were issued. The low interest was blamed to the fact that the oil and gas industry had not resumed previous levels of exploration activity after the economic crisis. So now they will give it another try but in a joint effort with the OGA. On the Faroese side of the border only 9 exploration wells and 3 onshore scientific boreholes have been drilled, of which only 3 were dry. None of the discoveries were commercial due to small sizes or tight reservoirs. The presence of a thick basalt layer complicates seismic imaging and exploration and makes drilling expensive. On the UK side of the border there are several producing fields (Foinaven, Schiehallion and Clair fields) as well as the Rosebank development and Siccar Point’s Cambo discovery. Siccar Point has also just started a drilling campaign up there with the Blackrock prospect (read also “Chasing big prospects (N)W of Shetland”). 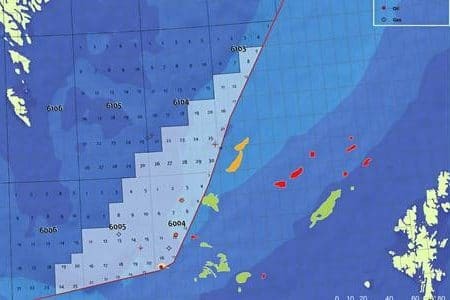 The Faroese Geological survey has already mapped out some four-way closures at several levels close to the UK border: Ymir Ridge, Wyville Thomson Ridge N (WTR-N) and Wyville Thomson Ridge S (WTR-S). Read here for more info. Depth map of the A-horizon, which is equivalent to the onshore coal bearing formation which represents the transition between the pre- and syn-breakup volcanism, as identified on seismic data by Petersen et al. (2015). The three four-way dip closures shown on the map are as follows: Ymir Ridge, Wyville Thomson Ridge N (WTR-N) and Wyville Thomson Ridge S (WTR-S). The maximum closure is 1750 m, 1200 and 800 m, respectively. Figure Faroese Geological Survey. 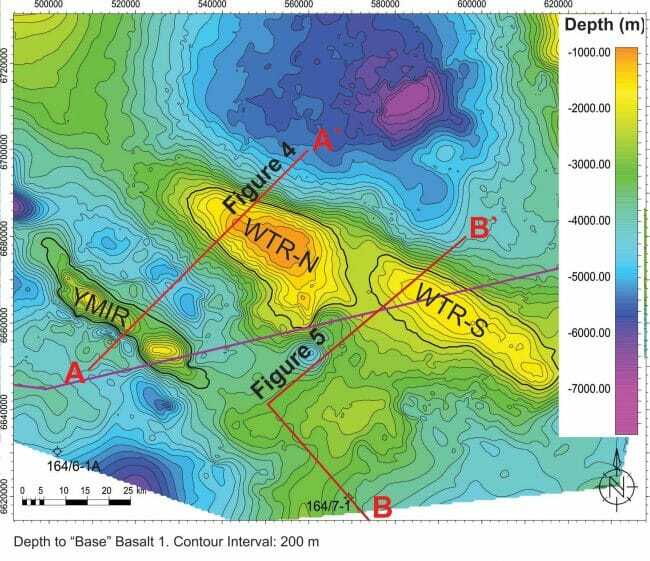 SW-NE orientated seismic profile across the Ymir Ridge and the northern part of Wyville Thomson Ridge. 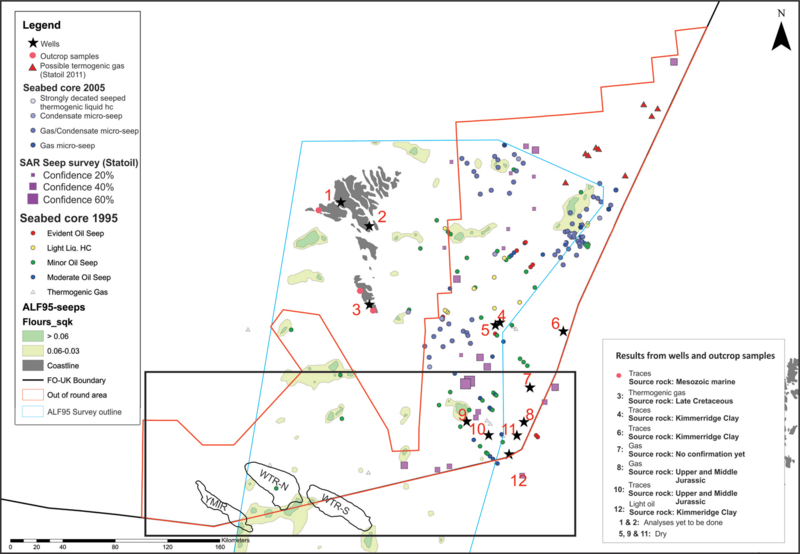 Figure Faroese geological survey.